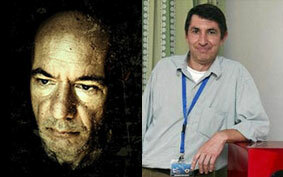 Panagiotis Kominos – the brains behind the ultra esoteric amplification that are made in Greece, based at Kithira – did not hold back during our telephone discussion: “have you ever heard something better or at least something that comes close?” asked me, with the certainty of a man that knows something very important that everybody else doesn’t! That made me feel a little uncomfortable, I admit. Already from my first contact with the company’s introductory models (STTS 220 & HAR AR1) I thought that I had never encountered such pure and natural sound (coming from a hybrid pre/power set mind you) in all my 25 years of reviewing. And while a reviewer must keep his cool, when dealing with the manufacturers or the distributors, the designer of Porfyra Audio was taking me out of my comfort zone by asking me such a question. What I was supposed to tell him when the item of our discussion was nothing less than the top proposal of his company, a four chassis amplifier set, with a tubed preamplifier and two mono block single-ended transistor based power amplifiers with 100W output each? In such cases honesty is the best evading policy and my answer was as simple as it gets: “no, I have never heard anything better or equal for that matter, at least from amplifiers that are made to pair with loudspeakers …easier than large Avalons”!!! 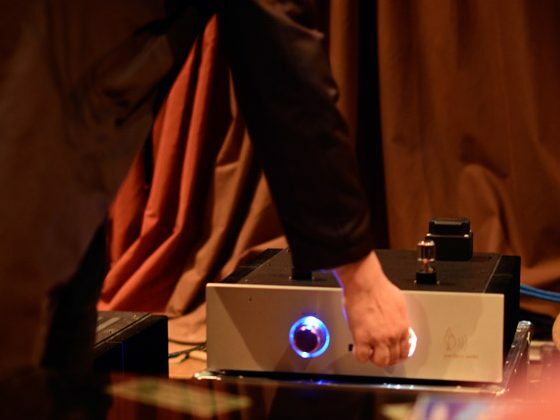 The truth is that the company’s small power amplifier STTS 220, with the 25 watts in pure class A and its single-ended topology, is a musical miracle when you combine it with higher sensitivity speakers, as its power comes with very low distortion for the first watt and has brilliant treble extension. This implementation, though, gets soon in trouble when faced with lower sensitivity and more complicated loads as the harmonic distortion rises fast when pumping out more than a few watts. The big mono blocks of course are way more relaxed and cool in that department, they drove the big Magnepans with ease, in a successful combination that made things even better because of these speakers ability to play in a “grand and clear” way even when fed with low power signals (as long as the amp can deliver current in such low loads). In any case, as we speak about power amplification without a phase splitter, the important condition about these amps is that the speaker that is connected to them can take full advantage of that first watt by delivering with ease the vast amount of detail that is hidden in these low level signals. From then on, the amount of available power becomes that more useful as the sensitivity of the transducer drops or the size of the room increases. 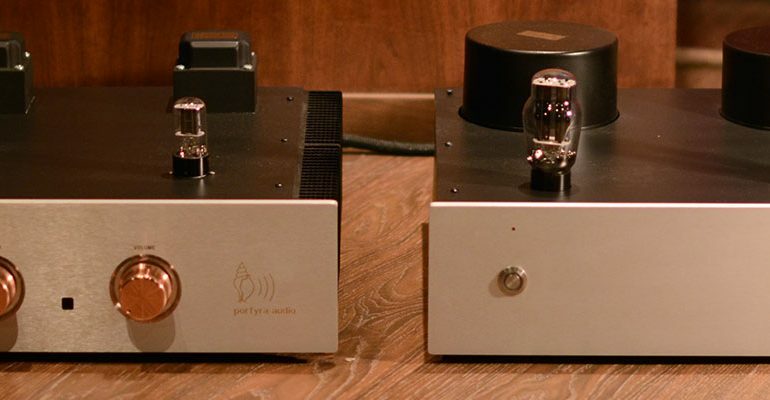 Porfyra Audio includes in its line of amplifiers, besides the small amp and the monoblocks, an intermediate stereo amp with 60 watts power delivery, with the same topology, that will hit the market when the time is right. Solid state amplifiers of that kind are of course extremely rare, and although they don’t have the outward-looking charm of a low powered tubed SET, they also don’t have their characteristic problems, such as higher distortion, higher noise levels (even the extremely open circuit of Porfyra’s amps is not completely free of hum noise as we will see later under certain circumstances), transformer matching or very low power output. The last is the most obvious limiting factor to the number of the loudspeaker solutions available to pair with a triode-based tubed amplifier, even though, in my opinion single-ended watts of any kind deliver a way better sense of scale, dimension and energy than any push-pull. So, because of all of the above we understand that the 100 watts of power from the STTS 1100 amps are truly a huge amount of power coming for a single-ended based amplifier of any kind and for that the 12.000 euros they cost for a set of mono blocks sound like a very sensible price to pay. I, actually, believe that they would seem like a true bargain in a well-developed market, and such market (abroad that is) is what every local high-end manufacturer should aim for (unfortunately out local market has shrunk with all the bad after-effects this brings). 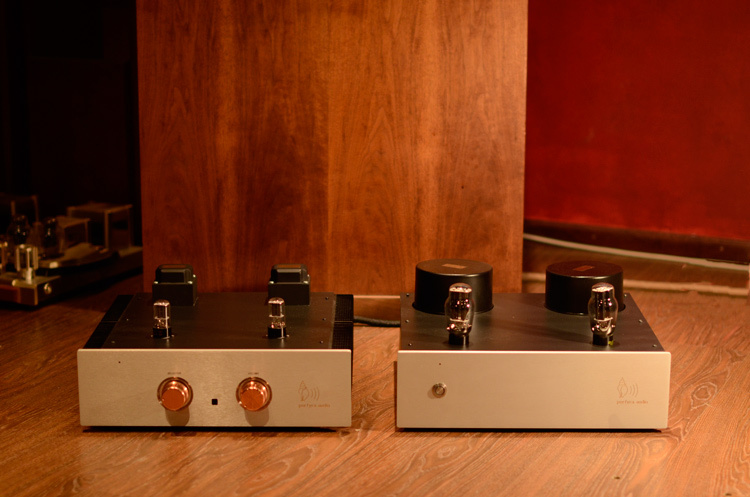 Now, the major question for us at hiendnews.gr is how do these Porfyra Audio single-ended transistor based amplifiers sound against a SET tube-based amp which translates in the following: is their timbre as natural persuasive or does the music flow as natural as a power triode based amp? Maybe in the beginning of this review I imply performance levels “beyond SETs” but the difficult part is coming… You see, the following lines are not only an attempt to describe as convincingly as possible the unique sound of the Porfyra amps but also to understand myself how these amplifiers from Kithira have made anything else “small and exotic” out there sound pretty much “conventional” at best, to my ears at least. 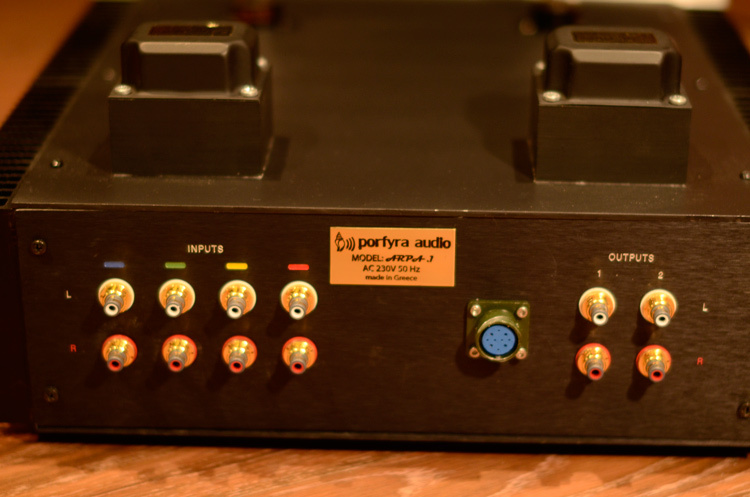 Porfyra Audio ARPA preamplifier. All-Tube glorious sound ! Silver cabling and Oil caps inside ! 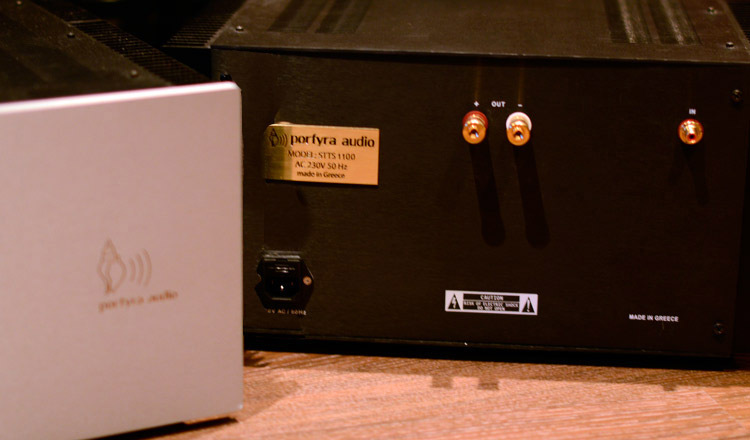 It maybe that Porfyra Audio is taking the minimalistic approach to the maximum, as far as the power but also the preamplifier are concerned, and some, like me, are as happy and excited like small children because of this, but the user who will be interested for these products usually appreciates aesthetics and ease of use too. Hi-end is a very noble hobby, but at the same time it should address every aspect of the regular life of the average user and should not make his/her life difficult with its own whims and inadequacies. Any manufacturer that does not pay attention to this side of its product character, in the name of sound quality, probably is sacrificing without knowing even their biggest invention unnecessarily. So it is with great pleasure that I conclude that the ARPA, the top preamplifier model of the Greek firm, does not only offer superb sound quality but also offers something unique, a color based code of communication with the user as they select an input! I like that very much because of its uniqueness but also because it makes the whole business of sound reproduction a little lighter, not as “serious” or eventually pretentious that so many other hi-end equipment try to be. So, at the rear of the ARPA we find four line level inputs with a different color assigned to each one of them (blue, green, yellow and red). The selector switch, of course, controls relays and with every choice the proper colored LED lights up! Volume control is also remotely controlled, and it uses an ALPS blue pot, but to tell you the truth I went traditional since I preferred to set the input and volume level by hand using the two gorgeously finished metal knobs than to use the cheaper feeling plastic remote. With a price tag of only 7.000 euros the ARPA would make many of my foreign colleagues drool as it looks like a very expensive power amplifier. The outboard power supply houses an 150VA power transformer and one rectifier tube 5Z3 (Sylvania) per channel, both of which protrude from the top of the chassis. Looking inside the PSU we find lots of parts, like a big choke and three huge paper-in-oil capacitors (Ducati, 25uF/450V) per channel, plus a small pcb with electrolytic capacitors and the time delay circuit board. 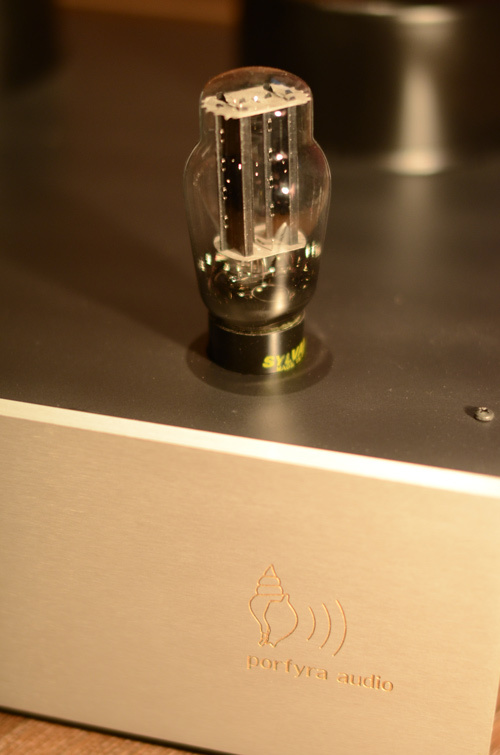 But the real money reside in the actual preamplifier chassis. In the front we find the two 6SN7 (RCA) signal tubes protruding from the top, the only tubes in the circuit, while at the rear we see, again protruding the two EI cores that are not transformers but “load chokes” as Porfyra calls them. 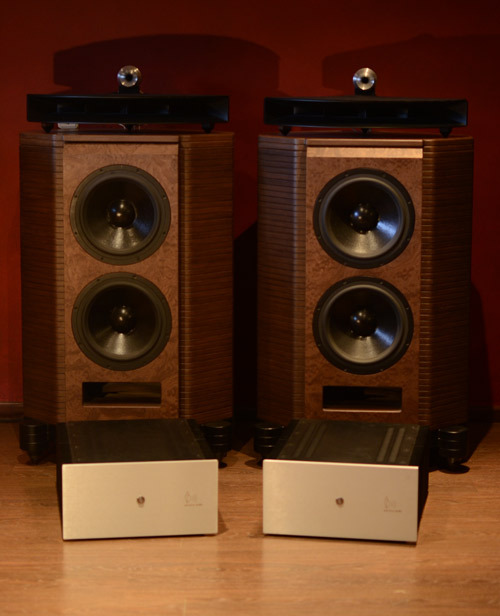 The insides look like a poem of simplicity and order, with separate chambers that physically and electrically keep the preamplifier sections away from each other, keeping the noise levels low, plus these increase the torsional strength of the chassis. The main “bridge” inside the chassis hides a group of four paper-in-oil capacitors for the tube cathodes, while the signal capacitors are also paper-in-oil, their circuit is placed on two small boards behind the heatsinks. These heatsinks host a few power transistors, which do not constitute a hybrid design, so don’t be surprised. The first heatsink contains bipolar transistors that act as current source for the regulation of the voltage for the tube filaments, while the other carries MosFETs for the high voltage regulation. Too much you would think. Maybe but the resulting sound is so “big” and detailed that is …scary! Porfyra Audio Power Amplifiers STTS – 1100 – Pure Class A / Single Ended 100 Watts – A timbre, transient and clarity Greek-made new King. The power amplifiers STTS 1100 must have the least amount of solid state components that I have ever encountered and they sound like such. The shielded 500VA power transformer, a huge choke and two 82.000uF/63V electrolytic capacitors cover the most part of the insides of each chassis, while behind the front resides a small voltage regulation board and a secondary small toroid transformer. The power amps are the “bad” boys of the set, as they do not hide their single-ended nature with tricks, leaving everything from ground up to pass to the speakers. The characteristic hum they create is independent of the volume control and probably a little higher in level than the typical hum of a low power, no feedback, SET but on the other hand the way they describe the low level signals is so much more intense than a low power 300B SET. Sorry tubed SETs, c’est la vie. Now, maybe some will blame me as a fan of transistors and will question the things I write about a group of eight PNP bipolar (MLJ 2193) transistors per channel, but these guys should hear the Porfyra Audio set driving Klipschorns, and by that I mean bare naked conditions that nothing can hide behind the set-up. Although the 104dB/w sensitivity of the big Klipsch made the hum more pronounced (way more than, let’s say, a Line Magnetic SET), and a little annoying without the presence of music, everything was forgotten after the music started. This way we got sound from a set of Klipschorns like we never heard it before, soft, relaxed, and so transparent, like a panel. We confronted the manufacturer about the hum, as we do every time we find something unusual, and they informed us that they will include a change in the power supply in the power amps if they are going to be used with speakers that are too sensitive (over 97dB/w) where it starts to be really noticeable (at the factory they do not use such very sensitive speakers). With my own open baffle designs of 95dB/w sensitivity I did not encounter any problems with hum using the small power amp. But what made truly an impression was the fact that even with the Klipschorns it was very easy to “reject” that noise and focus on the music. That happened because the frequency of that hum is totally uncorrelated with the frequency of the music program, its level remains constant while these amps continue to describe the information many dBs under it. You see, here there is not even a trace of information that can be hidden because of the anti-phase function of push-pull circuit, the noise or the distortion of a SET. Everything is revealed. The manufacturer states for this circuit a frequency response from 12Hz to 130kHz and power output of 100 watts, very good S/N around 90dB and distortion levels very low for the first tens of watts. All of the above constitute technical specs that no traditional single-ended tubed circuit can come close. Now, let’s take a look beyond the numbers. It is generally accepted that sensitivity to the so called “timing of the reproduced music” is a not the same for many listeners out there, while it has recently been proven that a trained ear is much more sensitive to inaccuracies in the time domain than what was, before, predicted. This explains, in a large degree, the differences that hi-end hobbyists exhibit about their preferences towards the different amplifier design trades where somebody’s blessing is someone else’s curse. For instance, low or even zero negative feedback, non-oversampling, low filter orders in loudspeakers and the absence of a phase splitter in the single ended amplifiers are some of the choices that have been reported (from the most sensitive to timing problems listeners) to result in lifting a gray vail from the music, releasing the color palette and the detail of the notes from their timing phases (attack, sustain, decay, release) favoring the transient details, giving a more free and natural flow to the music. On the other hand these techniques are reported (by the more sensitive to the frequency response, camp) to cause a more euphonic rotundity in the frequency curve, to force a warmer/sweeter hue thinning the absolute power of the extreme low frequencies, leading finally to a lazier interpretation of the natural force of the music for the benefit of creating a more inviting atmosphere. This fight keeps going for a long time and it will continue for a long time, but is it clear that both of the above happen simultaneously and that everybody’s right, they just differ on the degree of their sensitivity to that particular kind of distortion. Indeed, the precision in the time domain seems like its fighting that of the frequency domain in the world of hi-fi, thus resulting into truly courageous and ingenious efforts from a designer in order to get both of these under control. 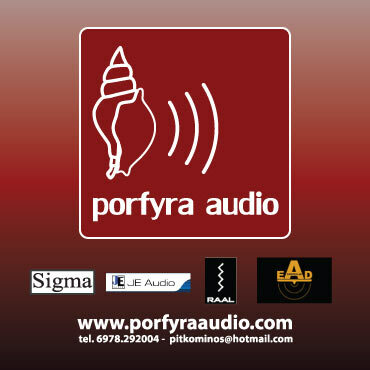 Porfyra Audio is one of those that have succeeded in this. Even though it is a tubed design, ARPA (like it’s smaller sibling HAR-AR1 that is currently using the 6H30 tube instead of the ECC188) does not have the classic warm, round sound of the species. With only one tube in the circuit, gourmet NOS components everywhere and an oversized power supply, it delivers detailed, dynamic, full bodied sound in an even bigger scene at such levels that it competes directly with the top preamplifiers of the market (solid state or tubed) but with way less cost. The character it exhibits is airy and homogeneous despite the huge soundstage, while the focus is fast, detailed and smooth, just like in reality. The various layers in that stage feel in the beginning like they are oversimplified but soon enough it becomes understood that the preamplifier sets things in space like a single full range drive unit, with its attack right on spot and the music wave following like a sphere around that spot. ARPA (like all power amps of Porfyra) does not follow the general direction of expensive hi-end towards a fancy glorified soundstage with as much denser, more solid and more anaglyph texture, but sticks on the time domain standards and transients, avoiding a glossier, than reality (thus more static) sound. This becomes more apparent by the absolute neutral temperature of its sound colors and the absence of a more generalized sweetness of its sound. How important this is, considering the levels of freshness, flow and overall musicality, becomes apparent through the way it unfolds its dynamics. The immediacy and the explosive directness that characterizes its sound is only comparable to top quality passive preamplifiers. There is no trace of artificial electrical overdrive or hysteresis for that matter, despite the 26dBs of gain. I have heard super analytic tubed preamps …attacking with “preset” electrical shouts or trading carefully between the dynamic details so that they won’t miss anything, and as a result listening to music through them becomes a boring procedure despite the initial wow factor. That Porfyra preamp selects, bravely and efficiently, the shortest path (after a fully passive design) and surely it will never be that piece of equipment that will be responsible to save a system from musical failure. But it will drive every power amplifier to its limits, reviling its character to the bone (as long as the input impedance does not fall below 25-30kOhms). With such a working environment for the RCA 6SN7 (per channel) it is difficult to imagine better company for the ARPA than a single-ended power amp. You can easily match it with a variety of SETs, getting as a result the transparency of a passive pre with the dynamics of a top notch active stage with your favorite triode and live happily ever after. 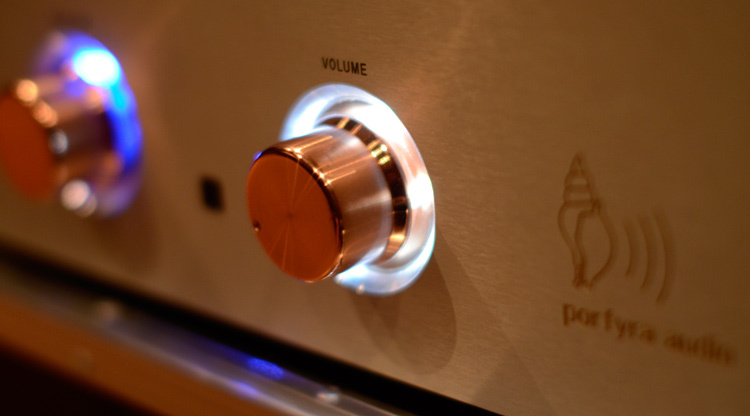 But, do yourself a favor, if you are fanatic about single-ended topology: try it with one of Porfyra Audio’s power amps. 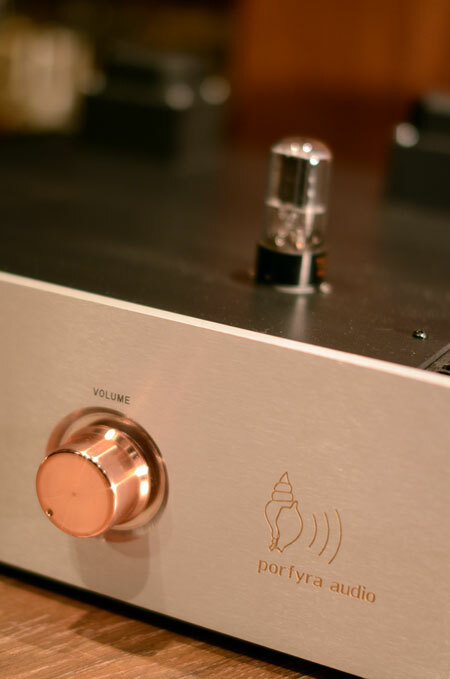 These amplifiers complete the house sound of Porfyra and with their preamps deliver such a pure, healthy and detailed sound that it needs to be heard to be believed. I, “unfortunately” heard that sound twice, first with the “small” models and now with the big ones (same style of sound, different scale of course for the big stuff), got it under my skin and really got into trouble (good one mind you)! The STTS-1100 –despite its huge power- responds to every speaker need with directness, control and lack of hysteresis that someone can find in small switching amps (small Tripath, Ncore), it is “pure” air in a sense. These switching amps though do not have such a definition of texture nor such body sizes, which develop forcefully surging the pace of the music – they are in a sort of way more static and flat – asking from the front end to “fill in” the gaps. On the other hand a SET is full of these elements that are missing from class D amps – but the force goes through …tolls, the output transformer that is, which sometimes does more than we expect, sometimes less, modulating in its own way the dynamic progress of the action. The power amp from Porfyra is typically “cooler” than a classic SET and less dense in harmonics, but that doesn’t stop it from sounding as vast and humane in the midrange, while being absolutely neutral, like its preamp partner. Harmonic density with excellent organic color exists of course and in the most genuine way you can imagine. It is not though ever present, definitely does not play the leading role in the description of the notes, it is as elusive but continuous, intensely reminding us of reality. Its finesse is spread equally well in the way it delivers the power of the music first hand, as it presents top notch dynamic directness steadily and independent from the scale of antithesis and all of the above is presented with such easy and freedom in the flow department that it will stun even experienced listeners. Low level detail on the other hand is magnificent, and so is clarity that goes so deep –without any hint of brightness- that stays forever etched in our minds. Analog sources: Thorens TD-160/TP-16 (mod), Gold Note Valore Italian Job/Bobolino, digital sources: Gold Note Koala/Dumbo, Line Magnetic 502CA, amplifiers: Bluenote Steroid 1 Sign. (mod), Sansui AU-505 (upgraded), KingRex T20+PSU, Nexus Tripath 1, preamplifiers: Primaluna Prologue Three, Loudspeakers: Ocellia Calliope.30SAG Sign. (main), Klipsch Klispschorn (mod. ), Mythos Visaton Horns, several DIY Fostex based, power cables and accessories Ringmat Developements, beech custom rack, AC filter Furman AC-210 & Shunyata Research Hydra. The top quality Porfyra set belongs in the most esoteric amplification cases of the market. It sounds as fresh as a morning breeze with unlimited dynamics, like a forceful stream of crystal like clarity that combines with rare artistic sensitivity and acoustic ability all the best of triodes, class A and single-ended topology. It is, probably, the ‎most austere (tonally), capable (dynamically) and immediate (time wise) set that we have heard till today, in an improbable combination that will steal your hearts.